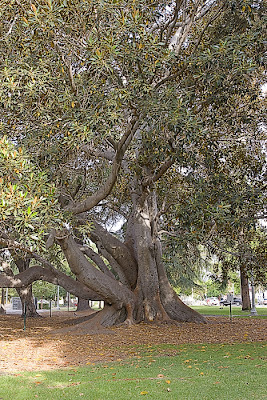 This Moreton Bay fig tree is right outside the entrance to the library. The signs say that climbing it is no longer allowed. When I was younger, it was my favorite part of going to the library. I wonder if it will be kept when the new library is built? And when my children have taken the tour of the library - Ms. Annette always mentions the tree will remain. That's good to hear. I couldn't imagine that it would be removed, but you never know. The entire design of the library is built around this tree and the other one on the south south side of the current building. This has been the number one concern from most residents - KILL CRAZY RUMORS - THE TREE ISN'T GOING ANYWHERE!